I’ve lived in London for over a week now and I’m still in a daze. Moving is always an intense experience, of course, but this time we moved to a new country to start completely from scratch. We know very few people here, and it’s a completely new environment. The simplest things like taking the bus, buying groceries, mailing a letter and even crossing the street - all things that I used to do on autopilot - now require thought and planning. Let’s talk about my oven, for example. There’s no temperature indicated anywhere, and the dial is marked with the numbers 1 to 9. I just spent the last three years figuring out celsius, but 1 to 9? Huh? I decided to go with 6 and it worked out just fine. Victory! Kalen: 1, British Oven: “Nil”. Other minor but awesome victories this week have included looking the right way when crossing the street, finding baking soda in the supermarket (bicarbonate of soda) and counting change correctly. I’m having a great week! Anyway, it’s these little differences and triumphs that make moving so exciting, and luckily I have a great apartment (and most importantly, a great kitchen). Since I have so much free time at the moment, I’ve been cooking a lot which helps me feel right at home. 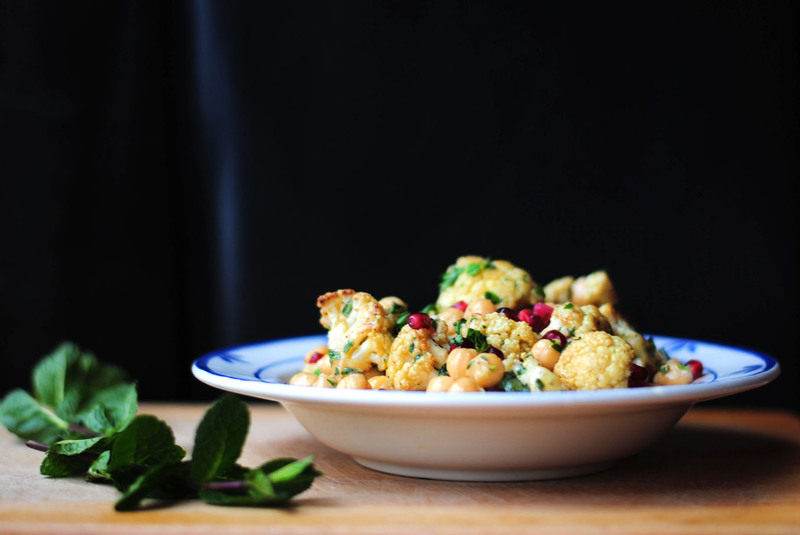 Yesterday, for example, I made this lovely roasted cauliflower and chickpea salad with a lemony tahini dressing, fresh herbs and pomegranate seeds for a touch of sweetness. It’s the perfect winter salad, both healthy and comforting. With food like this, I could feel at home anywhere. Toss cauliflower with olive oil and a bit of salt and pepper, and spread on a baking sheet. Bake for 30 minutes or until tender. Remove from oven and let cool. While the cauliflower is in the oven, make the dressing. Mix olive oil, tahini, lemon juice and garlic in a small bowl until smooth. Season with salt and pepper to taste. 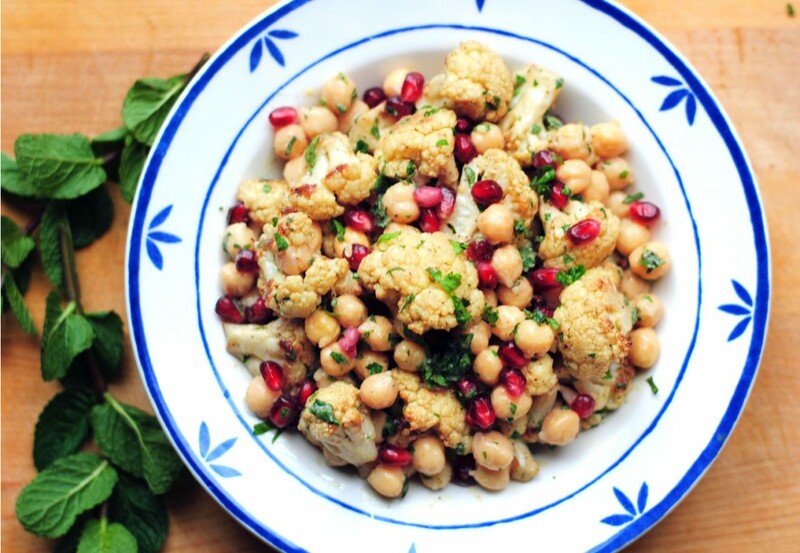 Combine cauliflower, chickpeas, pomegranate seeds and herbs in a large bowl. Toss with the tahini dressing and season with additional salt, pepper and lemon to taste. Serve at room temperature. Nice Blog and nice recipes !! Congratulations !! Thanks, Ricardo! Did you see the chili recipe? I’m an American expat living in London as well. I got here about a year ago, and I agree with you totally! The little things can be so difficult and hard to navigate, but cooking a nice meal can make a new flat feel like home. It really can, can’t it? The temperatures and measurements are so tricky. Nice to know I’m not the only one adjusting!